Apprentices’ Strike meeting in Queen’s Park. The national strike by apprentices was to demand fair wages, the right to union representation and an end to victimisation. Apprentices’ wages were extremely low, despite them often been asked to do jobs for which adult workers were paid danger money. It was also standard practice for companies to sack them when they became fully qualified and replace them with new apprentices who were much cheaper. The apprentices’ slogan was `All out together, all back together’ and they were successful in gaining union representation and fairer wages. I recognize that it was before my time as a Bolton Apprentice. I don’t know how successful this national strike was but when I started my Indentured Craft Apprenticeship at Hick Hargreaves in 1959 it was still a 48 hour week and my starting pay was ten pence ( old pence ) an hour. The apprentice boys in the machine shop had to wrestle to a submission every Friday after lunch. 8 lads to 4 lads to two finalists and eventually a winner. I dreaded Fridays because I never got past the second round. Hardman was the hero because he took one for all apprentices. P.C. 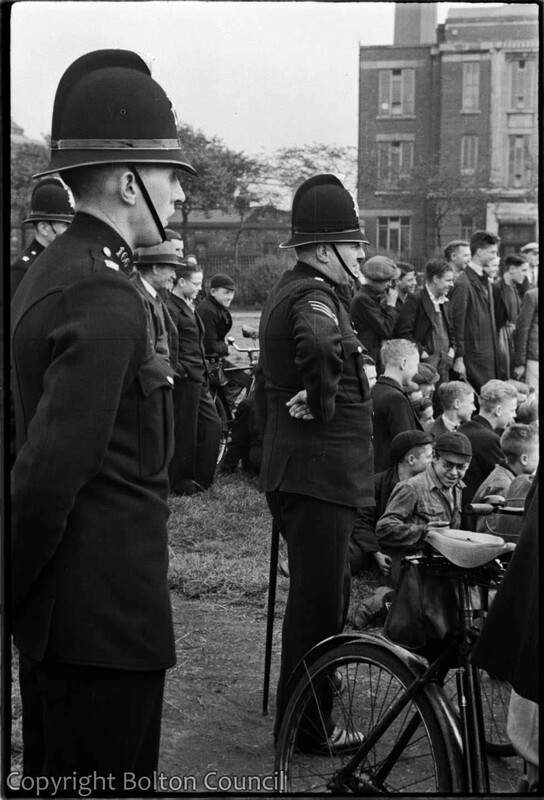 166 of the Bolton Borough Police in 1937, was PC Avery Stevens. He joined the force as PC 166 on 10.2.1930, was promoted to Sgt 24 on 21.9.1949 and retired as Sgt 11.8.1955.